Emerson wrote, "It is in the doing that you gain the power." As an artist, this quotation has great significance to me. It has encouraged me to paint when it seemed impossible. Painting the same subject over and over and gaining a rapport with the canvas has instilled in me a power and an inner strength which I believe is inherent in my work. Throughout my career, I have always been involved with art direction. In 1981, I moved with my family from Montreal to Exeter, New Hampshire. Two years later, I sold the agency to the employees to work on a new career in fine art. The agency has since been sold to D.D.B. Advertising and is called Anderson D.D.B. (Toronto, New York, Montreal and California). In 1994, I was Artist in Residence at the Vermont Studio Center. I have also studied figure drawing and advanced painting at the University of New Hampshire, and print making and sculpting at Monserrat College of Art in Beverly, MA. At present, I have studios and galleries in Rockport, Massachusetts, Portland, Maine and San Miguel de Allende, Mexico. 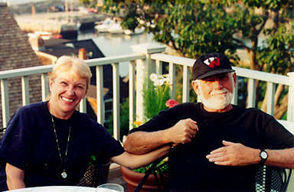 Jean and George Anderson at their Rockport home overlooking Rockport Harbor. Jean is well known as the owner Hannah Wingate Antiques located in Rockport MA, which specializes in primitive Canadian antiques and Mexican jewelry. 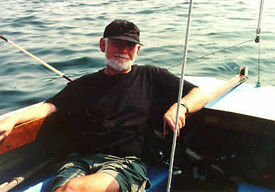 George Anderson relaxes by sailing in Rockport Harbor a short distance from his studio. George has owned a Rhodes 19 for 30 years which he has sailed out of Montreal, Portsmouth, NH and Rockport, MA.